Sophie’s Choice: You have to choose when there are no good options. 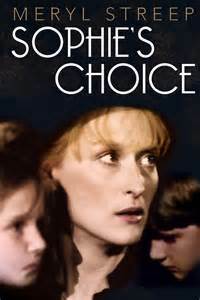 Sophie’s Choice was an award-winning 1983 movie based on the William Styron novel about a Nazi concentration camp survivor who was forced to choose which of her two children to send to the death camps. In this most heart-wrenching scene ever filmed, the woman must choose and begs to choose “neither”. For healthcare providers who are caught in a regulatory net by participating in government-funded programs, they were given a choice between installing an electronic health record system, attesting to meeting a list of nearly-impossible targets to get reimbursement for their multi-million dollar investments, or choosing not to participate which resulted in losing participation in said government-funded programs and incentives. Most providers bit. They had no choice. And when it came time to collect the Meaningful Use incentive dollars, they attested to meeting at least the minimum requirements. The government bit back. Department of Human Service auditors in the Office of Inspector General most recent review estimated that the Centers for Medicare and Medicaid Services has overpaid more than $729 million to providers whose paperwork didn’t pass muster. That’s more than a big whoops for many organizations. That can be an organizational nightmare to reconstruct and prove that your claims were accurate. Click here to read the story. All of these providers should begin – if they haven’t already – gathering the required documentation. While it varies by the program, [Erin} Whaley [partner at international law firm Troutman Sanders] explained it will range from security risk assessments to screenshots. For other measures, providers will need a patient list of an audit log. And documentation is required for every year attestations are made. [Matthew] Fisher [partner at corporate law firm Mirick, O’Connell, DeMallie & Lougee] recommended that healthcare providers run an internal audit or review to ensure all documentation and information resides in one place and can be easily accessed. Yesterday, I met a young physician at a barbeque. Our conversation led to the typical “what do you do?” When I asked her what specialty she was most interested in, she said she was considering geriatrics or ob-gyn but that the business of medicine had become so dominant that instead she was thinking about getting her MBA and switching her focus completely. This woman spent her early career as a trauma nurse. She loves medicine and loves patient contact. She is currently doing toxicology research and interested in Alzheimer’s Disease research. But her experience in the medical field is leading her to the conclusion that her brain and talents might better be used analyzing spreadsheets and business plans. I used to think that healthcare was a positive driver of gross domestic product and a thriving sector of the economy. Now, I wonder if our focus on healthcare as a business isn’t costing us our focus on patients and causing us to lose some of our talented and dedicated medical professionals to regulation and bottom-dollar mentality. Loss for the patient. Loss for the doctor. Loss for society. This is not a new thought. But this is a problem that is becoming so acute that to save medicine, we need to reprioritize what we incent, how we incent it and whether the recordkeeping is worth the price of time, focus and energy toward the business rather than the medicine. Health technology – like all technology – is making quantum leaps forward while we are looking backward to reconstruct Meaningful Use criteria that are quickly becoming meaningless. In this article on the future of Precision Medicine here, architects of the future of healthcare at the Precision Medicine Summit in Boston last week said that the future of Precision Medicine is more accurately Precision Health. Precision Medicine was about the use of system data to help doctors make decisions about patients; Precision Health is about patient access to their own data to make good decisions about their own health. This one move from focus on the system to focus on the individual calls into question the future value of the content of the electronic health record stored in your health system database as it relates to patient care. After all, we knew all along that the patient record was, at best, incomplete. It also further calls into question the value of the Meaningful Use criteria as they relate to the practice of medicine where it is today. Perhaps CMS needs to call a timeout on the HHS auditors, call the MU money well-spent where it incented progress, sunk costs where it impeded progress, and walk away from this program that was as well-designed as it could have been nearly 10 years ago before we knew what we know now. One Response to CMS Meaningful Use Payments to Providers: Incentives or Sophie’s Choice?